I cannot stand inedible garnishes. You don’t see them quite so much anymore, but back in the 80s and 90s, they were ubiquitous. Every restaurant was throwing sprigs of parsley or wedges of citrus fruit onto the side of a savory dish; no dessert could escape the inevitable cluster of mint leaves tucked artistically into the side of the sweet treat. What bothers me most about using any food as decorative garnish is not simply that it looks silly, sitting pointlessly alongside the food meant for eating, but that someone has decided that it is destined for the garbage bin and nothing more. 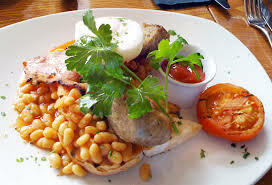 That parsley in the above photo has been artfully draped across the dish of cassoulet, or whatever that is. No one, not the chef, nor the diner, expects that parsley to be consumed. The diner will receive the dish, admire its beautiful composition, and then move the parsley off to the side of the plate and commence with the business of eating. When that dish is bussed away, the parsley will remain on the plate next to the half-empty ramekin of ketchup, humiliated and dejected, and wondering what it all meant anyway. As a person who grows parsley, among other things, I know that it doesn’t arrive at the store or restaurant miraculously. I also know that it doesn’t arrive in a package marked “decorative parsley.” The soil was tilled and weeded, the seeds were planted and covered. Over time, the seedlings sprouted and received water and sunshine until the mature plants formed leaves and were ready to be harvested. The leafy stems were then carefully clipped and gathered, gently packaged and transported to their destination. The goal, up to this point, was for the item to be consumed, not discarded. Food is not art, despite its ability to be simultaneously beautiful and edible. To forgo one for the other is wasteful and just not right. This brings me to nasturtiums. Among the fairly extensive list of edible flowers, nasturtiums remain my favorite. They are not only beautiful, they are incredibly delicious. Their peppery flavor is similar to nothing else I’ve ever eaten and lends itself to salads, sauces, desserts, and even cocktails. Because they are so colorful and eye-catching, it is not uncommon to see them served whole. Because we have been trained as a society that garnishes are not for eating, it is also not uncommon to see them return to the kitchen uneaten. I’m hoping to put an end to this rampant crime wave of nasturtium neglect. 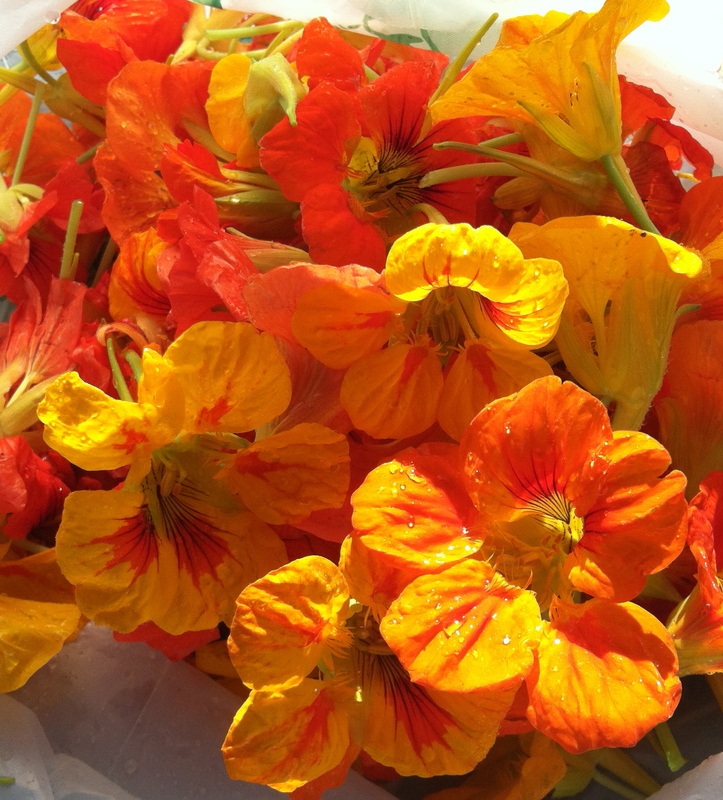 At applewood farm, we have had a banner year for nasturtiums. We planted them all around the chicken coop, as well as a healthy number in the flower bed that was made for the honeybees. It is now October, and despite the impressive chill in this morning’s air, both plantings were full to bursting with blossoms. It’s got to be one of the last times we’ll see this for the year. As we were picking this morning’s produce to bring down to applewood restaurant in Brooklyn, we picked arugula and lettuces, having a vision of a lovely autumn salad with all the flavors of summer still there. But if the folks who get the nasturtiums don’t know how wonderful they are, they will miss out on this last blast of summer, and that would just be a shame. This entry was posted in Uncategorized and tagged applewood farm, applewood restaurant, arugula, blossoms, edible flowers, edible garnish, honeybees, inedible garnish, lettuces, mint, nasturtium, organic farming, organic gardening, parsley. Bookmark the permalink. When I put a parsley garnish on the plate at home, I *expect* it to be eaten! 😉 Thx for sharing this amusing tale!